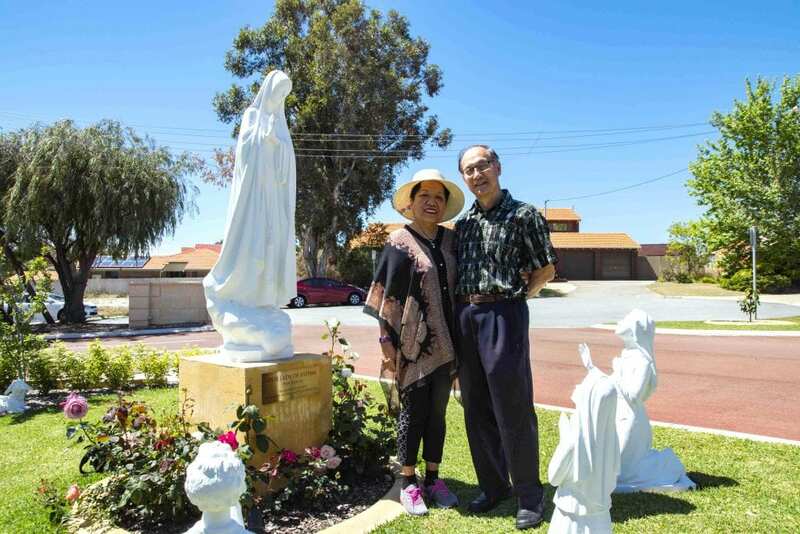 Martha and Edmund Cheong are regular fixtures at Sts John & Paul Church in Willetton. Photo: Matthew Lau. Not knowing a single soul in Australia when they migrated from Brunei 32 years ago, Martha Cheong DHS and Edmund Cheong KHS knew the Church was the place to build their foundations. Now, as prominent Willetton parishioners, the Cheongs have passed down the legacy of their faith to their children, grandchildren, and many others who they have encountered over the years. Martha and Edmund share the same birthday on 19 January, turning 70 and 72 respectively last Saturday. They met in their hometown back in 1967, which led to their marriage on 20 November 1971 at Seria Church of Our Lady of Immaculate Conception. Edmund and Martha Cheong at their induction into the Equestrian Order of the Holy Sepulchre in 2013. Photo: Supplied. The Cheongs were inducted into the Equestrian Order of the Holy Sepulchre as knights and dames in 2013. They have visited the Holy Land on four occasions, arranging for groups of parishioners to join them on pilgrimage. Martha, nicknamed “Mother Superior” by her peers at Sts John & Paul Church, believes the greatest legacy she can leave their four children and five grandchildren is a relationship with God. “I always encourage people to not be ashamed to show your faith,” she stated. Before reaching retirement, she did pastoral care at MercyCare Residential Aged Care Wembley for 18 years – she now sits on the Willetton Parish Council and runs the John Paul Prayer Ministry. “It amazes me to see how my parents, at their time, really showed their faith and love of Jesus in a very special way. “We were very poor, yet we were very happy people. Our parents always ensured that charity towards spirituality always comes first,” Martha expressed. Married since 1971, the Bruneian couple appreciate the value of praying together daily. Photo: Matthew Lau. Her upbringing taught her that by believing in Jesus and bearing one’s own Cross each day, that He will carry always us through the tough times. “We knew nobody when we first came [to Perth], the Church became our family. The parishioners here gave us the courage to meet people and integrate in Australia,” she recalled. Prior to retirement, Edmund was an engineer for Brunei Shell Petroleum; two of his sisters were nuns. He dutifully served as an Acolyte at Willetton Parish for five years, and is now a volunteer cash counter of the weekly collections. “The political situation in Brunei is very different,” he said. The Cheongs have volunteered much of their time to Willetton Parish over the years. Photo: Matthew Lau. Edmund and Martha have been part of the parish’s RCIA core group for the past seven years. Martha recalls the journey of a catechumen from Brunei who experienced a traumatic childhood. “Her husband is a Catholic; I saw them once and never saw them in the Church again, until four years ago, I met her at the gym, and we were talking about daily spirituality with each other – I got to know her,” Martha said. “I told her: ‘If you are interested to find out why we are the way we are, come and join us on Sunday’. From that day onward, she never regretted it; she found Jesus, she found the parish family, then she found her own-self, before she used to be very ‘closed up’. The Cheongs organise the Praise and Worship sessions on Wednesdays, and the Divine Mercy on Sundays “for the general good of the parish”.